Like wedding hosts, wedding guests must fulfill certain obligations. Upon receiving the wedding invitation from the host, it is your duty to properly respond. When the wedding host sends an invitation with an enclosed response card, it makes it very easy for you to reply. Postage is usually already included, and all you must do is write your name, indicate whether or not you will attend, and drop the response card in the mailbox. Read the invitation carefully, and note the date that the response card is due. Respond immediately, especially if you know that you will not be able to attend the wedding. This helps the host with the head count for the wedding reception plans. Note who is invited to the wedding. The invitation will specify which family members and guests are included. If a child or a guest is invited, his name will be on either the inside or outside invitation envelope. If a name is not mentioned, then that person is not invited to the wedding. Respond accordingly. Wedding response cards have two phrases below the name line. The phrases are variations of “Accepts” and “Regrets,” and each has a line that you can check to indicate your attendance status. If the phrase below the name line reads “Will ____ Attend,” leave it “as is” if you plan on attending. If you won’t be attending the reception, write “not” on the blank line. Indicate your meal choice, if applicable. Some wedding hosts include all of the dinner options that will be available at the reception. If attending the wedding, indicate the meal choice of each person in your party on the appropriate line. If you are single, it is not mandatory that the couple invite you along with a guest. If your name is the only name listed on the invitation, you are the only one invited. Do not call the host and ask if you can bring any guests not listed on the invitation, or show up at the wedding with an uninvited guest, according to Emily Post. 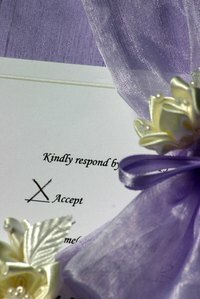 Wedding Channel: How Soon Must You Respond to a Wedding Invitation?